Prepare the Buttered Rum Shortbread Cookies: In a medium bowl, whisk together the all-purpose flour, tapioca flour and almond flour until well blended. Set aside. Using an electric stand mixer fitted with paddle attachment, or handheld electric mixer, cream together butter and sugar until light and fluffy. (Omit sugar if it is already incorporated into homemade almond flour and simply beat the butter until light and creamy.) Beat in the rum, almond extract and salt until well blended scraping the bowl with a rubber spatula when necessary. On low speed, gradually add flour mixture and mix until fully incorporated. Divide dough in half by scraping onto separate sheets of plastic wrap and flatten slightly into disks. Refrigerate the disks in plastic wrap for at least 2 hours or overnight. Arrange oven rack in lower third of oven and preheat to 375ºF (190ºC). Line two baking sheets with parchment paper; set aside. Working with a separate piece of dough at a time from the refrigerator, gently knead chilled dough until pliable. Roll dough between two sheets of lightly floured plastic food wrap to 1/8-inch (.32 cm) thickness. 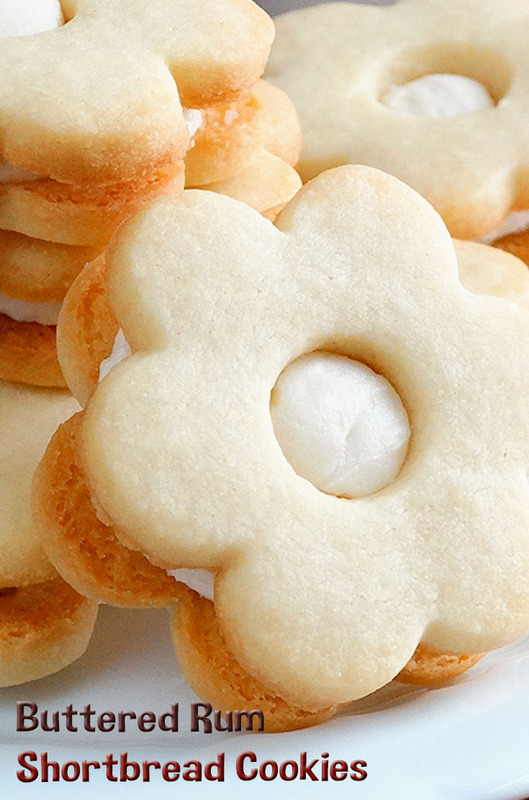 With a small scalloped cookie cutter dipped in flour, cut into shapes. Using a small metal cookie spatula, transfer cutouts to prepared baking sheets spaced apart by at least 1 inch (2.5 cm). With a small pastry tube, cut out ½-inch (1.25 cm) holes in the center of half the cutouts as these cookies will serve as the top layer of the cream-filled sandwich cookies. Meanwhile, continue to roll out the remaining dough and rerolling scraps as well as chilling the dough as necessary. Bake in preheated oven until the cookies are just beginning to turn light golden brown in color, about 8 to 10 minutes. For even baking, rotate the cookie sheets from front to back halfway through baking time. Using a metal cookie spatula, carefully transfer cookies to wire racks to cool completely. Prepare the Rum Buttercream Filling: Using an electric stand mixer fitted with paddle attachment, or handheld electric mixer, cream together butter and sugar until well blended. With mixer on low speed, beat in the heavy cream and rum until smooth and fully incorporated. Assemble the Buttered Rum Shortbread Cookies: Using a small metal icing spatula, spread a rounded ½ measuring teaspoon (2.5 ml) of the Buttered Rum Cream Filling on the underside of the whole cookie bottoms. Place the cookie tops (the cookies with the holes in the center) on top of each cookie bottom gently pressing the two cookies together. Continue in this fashion for the remaining cookies.